As a restaurant manager or owner, you value your patio spaces. These areas are revenue powerhouses that help seat the overflow of diners. 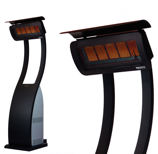 Patio heaters help restaurants maintain longer hours of operation for their outdoor spaces during the cooler months. Here you will find all the electric, propane and natural gas heaters you need, available in stand up, ceiling or wall-mount styles. We carry all the best lines in the business, including Infratech, Sunray, Calcana, Schwank, Sunpak, Bromic, Detroit Radiant, Sunglo, and Enerco. Each manufacturer has great qualifications and there are several model features that allow for quick operation and temperature control. Commercial outdoor dining areas most frequently use infrared ceiling or wall-mount heaters, while the stand-up heaters are valuable for their portable spot-heating capabilities. We highly recommend models with two-stage heat in both manual and wireless remote control operation for outdoor patio spaces. You cannot afford to reduce your seating capacity just because it's cold outside. 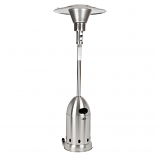 When you buy restaurant patio heaters from us you get excellent customer service, product selection, replacement parts and accessories, and so much more. Let us set you up with the electric or natural gas heater you need to maintain patio space revenue. For specific product inquiries, please call 800.549.5077 during West Coast business hours. You can also use our online support form.